Skagway, Alaska became the way into the Yukon after completion of the White Pass and Yukon Route RR. Started in May 1898 and completed in July 1900 it is a marvel of engineering and construction. By that time the Alaskan gold rush was over. I've included a link to railroad website if you want to read more about it. If you go on an Alaskan cruise, almost all of them stop in Skagway for the day. One of the excursions is taking the White Pass and Yukon Railroad up to Canada and returning. The train leaves from the cruise ship docks and returns you there about 4 hours later. Your pov really emphasizes just how gigantic this ship is...amazing shot! Oh yes, we enjoyed riding the White Pass train while there in Alaska a few years ago. We also went on a Princess ship as well; however, not as large as that in the photo. We were on the original "Love Boat" which was great. This is a wonderful capture, and it brings back such great memories. Thank you too for your comment on my photo today. Great catch... wonderful light & comp! Excellent choice of POV to marry the two modes of transportation. 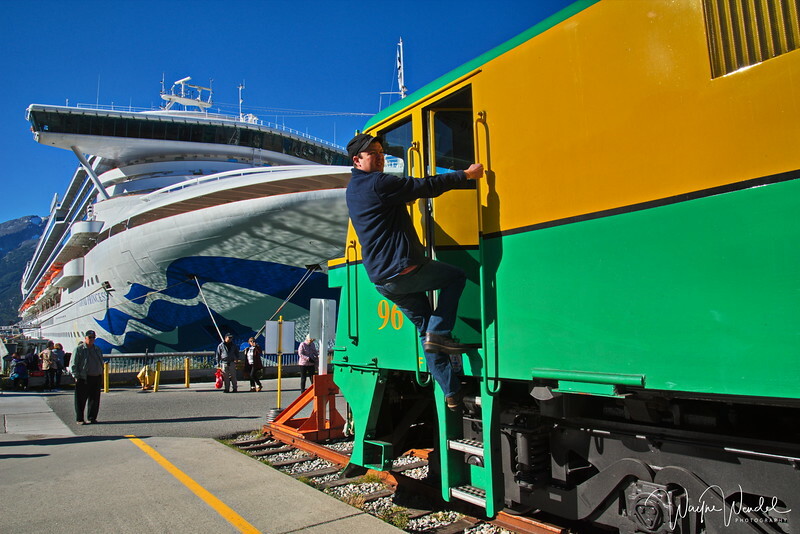 I think it's fair to say the cruise industry and the railway tourism industry have a symbiotic relationship. Love the light from the harbor water that bounce off the underside of the prow of the ship. Sounds like that would be fun! Great comp and capture of both ship and train. Love this shot! Excellent and I agree with Frank on the placement. ID'd this right away from the distinctive colors used by WP&YRR. Great shot to get the cruise ship & train in same frame.